Last week, Bryan took me out on a date that had been scheduled for weeks in advance. I was so excited to get dressed up. Put on mascara. Wear a bra. Dumping the mommy uniform and exchanging it for the trophy wife costume was such a cheap thrill, and being surprised was even more exciting. We drove up to parking garage of The Grove and I was hoping that the big surprise date was a tea party at the American Girl Store. It was either dining with dolls that cost more than most people’s monthly mortgage (those dolls are the 1%) or going on a shopping spree through Nordstrom after hours, but Bryan confirmed the date was neither of those experiences. I quickly mourned the absence of hanging out with the threads of Savvy and t.b.d., and then we took a turn toward the movie theatre. Why we would schlep to Hollywood to go to a movie theatre at The Grove when we have perfectly good theatres out in the ‘burbs was beyond me until we walked into the lobby and encountered a line. I knew it must have been for some special showing of something, but had no idea what it was until I saw an official-looking woman walking by with a poster and an easel. The artwork was recognizable as something I have been dying to see ever since I heard about the project almost two years ago; We were in line to see an exclusive screening of the NBC show Smash that debuts after that football game thing in February. Girl squeal times a trillion. We had arrived at 5:30 and we weren’t allowed into the theatre until about 7, so we made friends with the people in line around us. Since I didn’t know the agenda of the evening, I wasn’t sure what the food situation would be — and neither did Bryan — so since I was a little hungry, I ditched the line and got take-out from the restaurant next door to munch on while we waited to get inside the screening. Thuggish waiter: So you can’t have ranch dressing, right? Alison: Well, no, I just don’t like it. But I love BBQ sauce, so I’ll take that. Thuggish waiter: Yeah, but I heard you’re not allowed to have it. Alison: Oh, um, I’m allowed to have it. I just don’t like it. So… yeah. Thuggish waiter: So your doctor doesn’t tell you not to eat ranch dressing? Because my girlfriend’s doctor told her not to have it and she’s, like, ten weeks along or something. Thuggish waiter: The baby. You can’t have it because of the baby. Alison: Oh! Um. Yeah. I already HAD my baby. So, I just don’t like ranch dressing. I’m not pregnant. Thuggish waiter: You’re not? Oh. Alison: Yeah, [awkward laughter at the douchebag-ness of this guy] HA HA HA HA HA, I already had a baby. Anyway, yeah HA HA HA HA HA, just no ranch. I don’t like it. I think he blushed out of embarrassment, but I couldn’t tell because of his tattoos. And then, to save face, he threw in free cookies and brownies, which is like, so not fair because that’s clearly why I look pregnant! So, on the big date night out after the end of my pregnancy, apparently I looked pregnant. Which is almost kind of maybe perhaps a little bit funny because I was pregnant. Five months ago. It’s not that I let the thuggish waiter get to me, but he kind of confirmed something for me that I already knew. It’s time to get serious about being unpregnant. I mean, I enjoyed blowing up like the Good Year blimp for 40 weeks, but now I have a five-month-old and I think it’s fine time I appear to not be carrying her Irish twin. So we are saying bye bye to the poochy tummy. I signed up for a boot camp, which is a miracle because it’s no secret that I am anything but athletic. And to be there and working out at 6:30 a.m. must mean that those Mayans are right about the end of the world and all that jazz. It’s been nine days of an intense circuit training regimen and eating healthy power foods. I’ve lost six pounds. I mean, probably only due to the shock my body is going through, but I notice a difference. I don’t have a weight goal. I’m not even obsessed with the size on the tags of my clothes. I just want to look good naked. That simple. We already know I don’t like caloric condiments like ranch dressing so I am on the right path! I really am cracking up about how clueless that guy was to insinuate I was pregnant. I’m not really insulted because he wasn’t that intelligent. I mean, unless you can see a woman crowning, every smart man knows not to gamble that tricky and amorphous tummy which can be the result of a big dinner or a disguised, front-wearing fanny pack. Or, in my case, the deflated home of an evicted baby. 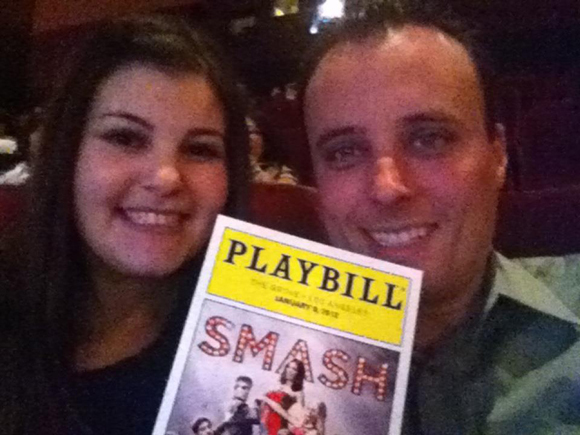 Oh, and in case you’re wondering, Smash is a smash! It is definitely going to be the best new show on television and I highly recommend it to everyone. It’s just so perfectly produced and I was literally lifted out of my seat and blown away by the concept. And, you know, it’s not easy for a pregnant woman to be blown away.